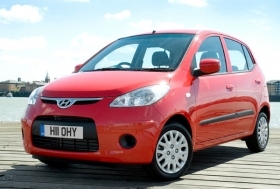 Strong sales of the i10 have helped Hyundai boost its market share in Europe. MUNICH -- Scrapping incentives in Europe's five largest markets helped boost the region's overall new-car registrations in July and August. Government-funded programs that encourage people to trade in old cars for newer, more fuel-efficient models have led to three straight months of increases in Europe after 14 consecutive declines. Eight months into the year, new registrations were down 6.6 percent to 8,980,598 in western Europe and 26.8 percent to 584,919 in the new EU countries. July was a great month for most Asian automakers. Nissan reported a 21.6 percent gain to 36,544 in July while Suzuki was up 5.0 percent to 21,667.